Coontail has finely-divided leaves arranged in whorls of 5-12 and is bushier towards the top. It has a hollow stem and lacks true roots. Coontail has a number of physical characteristics that will allow you to identify it. The plant actually lacks true roots, though it may be loosely anchored to the sediment by pale modified leaves. The central stem of the plant is hollow. 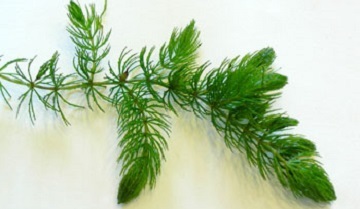 The plant's dark green leaves are 1-3 cm long and are spiny and forked. Upper leaves may reach the surface of the water. The leaves are arranged in whorls of 5-12 at a node. Whorls are more closely spaced near the end of the branches. Flowers are tiny and hidden in the axils of the leaves. The plant may be long and sparse, but is often bushy near the tip with an appearance like a racoon's tail, this is how the plant received its name. Found in hard water throughout the United States. Dibrox® and Spritflo® herbicide will treat coontail. Hydrothol Granular, Aquathol K, and Aquathol Super K are some alternative treatment methods. You can order these products on this website.